The Moki PairBuds Wireless Bluetooth Earphones are the latest true stereo, true wireless earbuds. Using the latest in Bluetooth technology, PairBuds deliver an impressive stereo sound without the use of any connecting wires or cables. 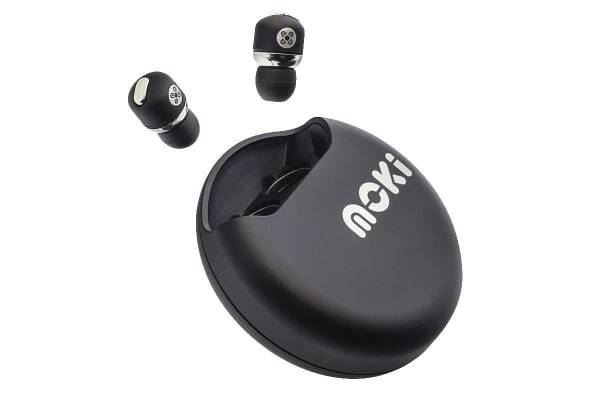 Optimised to use tiny 6mm micro drivers, the Moki PairBuds Wireless Bluetooth Earphones deliver a superior sound no matter your choice in music or device. The brilliance of Bluetooth 4.1 means they can reach more frequencies without clipping high-end, use less battery power for longer playtime and they self-pair to each other which simplifies the pairing process to make them incredibly easy to use. Moki PairBuds come with their own ChargeDock case which keeps them safe and automatically tops up their batteries at the end of every session, allowing up to 60hrs playtime from a charge. The PairBuds ChargeDock can also be used as a power bank for topping up other USB powered accessories in an emergency.